Before my research, I thought my findings would create a word cloud full of names of religious leaders. Looking further, I realized my assumption that there would be specific leaders whose names were prominent was not entirely accurate. 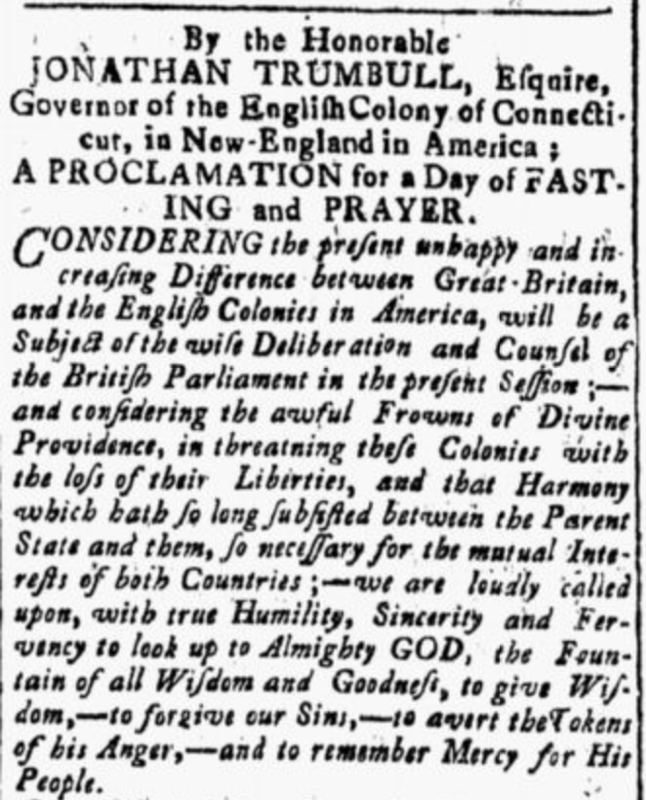 While the American Revolution had notable religious leaders, none seemed to stand out specifically during my research. Instead I discovered the overarching idea of religious leaders without them being mentioned by name. Religious leaders all over the country took part in the American Revolution. While at first shocking, the word cloud makes more sense when knowing this information. Instead of specific names appearing everywhere, we see things such as “religion,” “government,” “congress,” “country,” “public,” “people,” “colonies,” and so on. 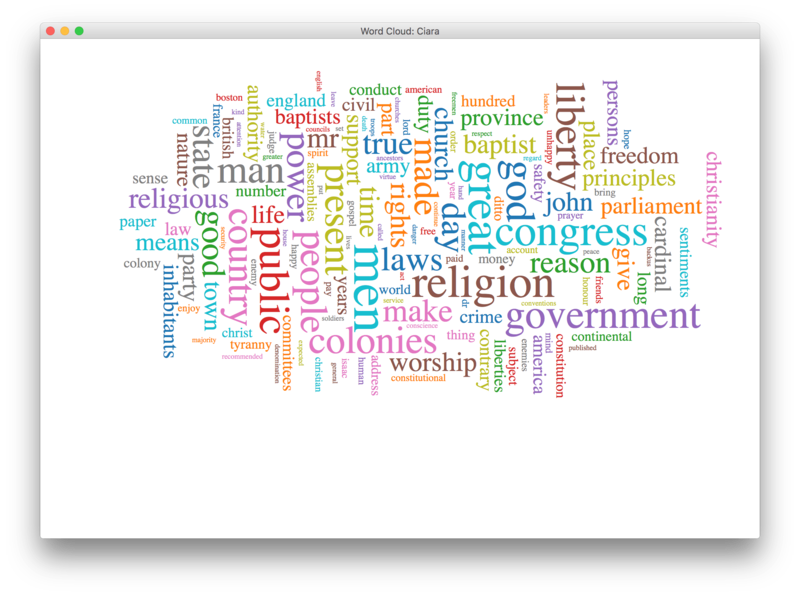 The word cloud is a key point to getting the idea across that religious leaders during the American Revolution frequently took on the same roles. The leaders had a wide variety of roles, but none stood apart from each other. As opposed to just serving their respective congregations or religious groups, these leaders took roles in government, congress, other political roles, various public roles, and so forth. From my research, I was able to observe how religious leaders branched out of their religious sects to help what was best for them and those around them. Religious leaders were integrated into society just as everyone else at the time was. They served in religious roles, political positions, and military occupations. They encompassed all areas of society, and took part in the American Revolution just as other colonists were doing. The reason that specific names of religious leaders didn’t appear as often in my search for them was that they held more roles than just that of a religious nature. Throughout the American Revolution, religious leaders took more of a role than their occupation seemed they would. They reached beyond their religious life, and took up the cause of the American Revolution. In one article, we observe a day of fasting and prayer being declared. Religious leaders are not specifically mentioned by name. Instead, it is mentioned that they and other colonists will take part in this day. In another article, we see a religious leader gather others in his house to discuss what is going on around them. These leaders are not prominent names that stand alone in history. Instead, religious leaders at the time of the American Revolution all played a significant role in their communities. In many contexts throughout my research, politics and government roles would frequently overlap with religious ones. This further explains the prominent words seen in the word cloud. Religion caused some tension for specific colonists, as some saw the American Revolution as going against their religion and allegiance to their church. Some leaders were able to flip this outlook and get the point across that tyranny and a monarch is not what they had allegiance to. They portrayed the American Revolution as something that was actually beneficial to their faith, and that went along with their religion. They were fighting for freedom and liberty. With that being said, some religious leaders also took a step back from religion, as they were some of the people that viewed the American Revolution as going against what their religion stood for. In this case, the religious leaders’ role changed in another way—instead of taking on more responsibilities, they shed their role as a leader in the religious world and become more of a layperson. They no longer formally or officially held the importance they used to and were no longer a person people looked up to in their religious life (as well as their entire life in general) for guidance or answers. After my research, I came to a few conclusions about my topic. For starters, my initial thoughts turned out to be the opposite of what my research showed me. Instead of finding prominent religious figures, I found generalizations and common bonds across many of them, none really standing out more so than others. Another conclusion was that while some religious leaders stepped back from their role in religion, many took on greater responsibilities to support the revolution, and did all they could to help the colonists. Finally, I established that religious leaders could play whatever role appealed to their convictions. From politics to religion, and everything in between, religious leaders took up the cause of the American Revolution. Ballenas, Carl. “Religion and the American Revolution” The Richmond Hill Historical Society. Butler, Jon. “Religion and the American Revolution.” National Parks Service. “The Church And The Revolutionary War.” PBS. Heyrman, Christine Leigh. “Religion and the American Revolution.” Divining America, TeacherServe©. National Humanities Center. “Religion and Revolution.” Religion and Revolution : The Colonial Williamsburg Official History & Citizenship Site. History.org.